M.K. 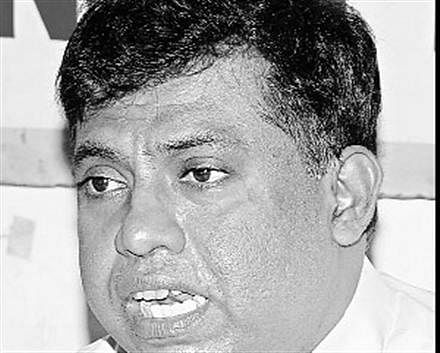 Sivajilingam, who was elected to the Northern Provincial Council (NPC) as a member of the Tamil National Alliance (TNA), broke away from the rest of the TNA councilors and got sworn-in separately on Monday at Mullivaikkal, the scene of the infamous carnage in the last phase of Eelam War IV in May 2009. Nine TNA dissidents, including Sivajilingam, were planning to get sworn-in at a beach side Hindu temple in Mullaitivu on Monday. But they gave up the bid in response to an appeal by the Bishop of Mannar, Rev.Rayappu Joseph, who told them not to precipitate a crisis in the TNA so soon after it was elected bagging 30 of the 38 seats up for grabs in NPC. Except for Sivajilingam, the rest of the dissidents will now be sworn-in at Jaffna, probably by Chief Minister C.V.Wigneswaran. The rebels were protesting against the distribution of places in the Board of Ministers and offices in the NPC. Sivajilingam’s oaths, one of which, ironically, was to preserve the unity and integrity of Sri Lanka, was administered by Dr.Mayilerum Perumal, the doctor at Valvettithurai Government Hospital who treated Parvathy Ammal, mother of the LTTE chief Velupillai Prabhakaran, in her last days. Sivajilingam, a distant relation of Prabhakaran’s, had looked after Parvathy Ammal in her last days, though he was in the Tamil Eelam Liberation Organization (TELO) and not the LTTE.